Setting up the business online is not an easy task. Admit it guys, managing and scaling out the essential budgets has become a real trend that companies are using for their profit margins. However they somehow increase the reach and brings out a global presence for the businesses, but some of the growing companies like digital marketing firms, data mining and SEO agencies often find it difficult to measure out the margins because of their dependency on the local resources and more especially, the IP addresses. Lucky for you, if you own or work for such a company, then we’ve a solution that can largely help you to increase your profit margins. Since most of the digital and SEO agencies rely on IP addresses; therefore we’ve a company that provides lease solutions for IPv4 and IPv6. The online network company Infinitum Networks is mainly known to entitle you with the power of leasing a block of IP address that can be varied by your geographic location or if you want to target one. Within 2-3 easy steps, you can quickly setup your business by your geographical location; therefore IP leasing was never so easy for all the online businesses. Therefore, without any further blabbering, let’s start the review of Infinitum Networks, a company that provides affordable IP lease. Being a part-time blogger and a full-time marketer, IP leasing for me is like a boon. For the past one year, I’ve been using these services for most of my marketing campaigns and has given strong and desirable outputs. Moreover, I recommended the 2x /24 IPv4 subnet plan nearly three months ago to one of my clients. Once the purchase was made, Infinitum networks started the verification process with necessary ID details and the IP subnets were deployed within an hour. The LoA were sent immediately, and the IP addresses were live after 24 hrs with in the perfect running state. During the first time, the DHCP-enabled client started to attempt to join the existing network. Later on, the process initiated automatically, and the DHCP server initialized to lease the IP addresses respectively. What can Infinitum be used for? If you’re still not sure about what IP lease is beneficial for, then here are some of the best uses that you can ponder. 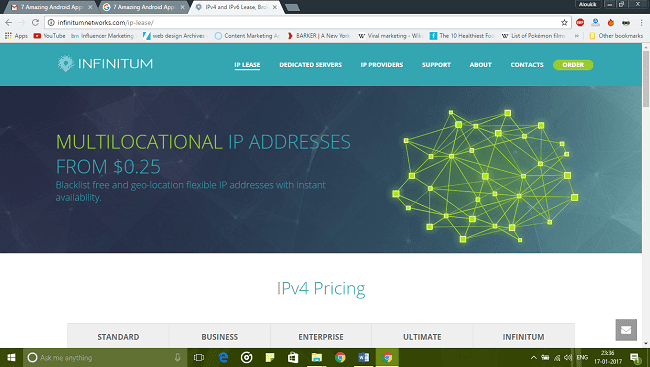 One of the most beneficial uses of having Ifinitum's leased IP is for the VPN (Virtual Private Network) access. Since there are a lot of websites and online services that restricted to access via some geographical locations, IP lease comes handy in such situations. Take the example of the best known Netflix and YouTube which is limited to few specific areas only. Therefore, If you are living in a country that lacks the support from such websites, then you can surely access them with the use of a VPN and Infinitum helps you with the stuff. Similar to geographic restriction scenario, there are many websites which can’t be accessed on a local basis. For example, a private network established in your work or college doesn’t usually allow you to access various social media websites without restrictions. That’s where Infinitum comes handy and having an IP address from an entirely different locations allows you to bypass the restriction, and successfully browse the websites without any hassle. Another remarkable application of having a Geo-location based IP is its application in data analytic and data mining industry. Infinitum Networks can also help your company to stay a step ahead with multi-location based testing and research work. Instead of the limited local search engine queries, you can analyze the data on a global basis as well. IP leasing helps you to mirror your location smartly with the affordable leasing plans. Search Engine Optimization (SEO) as we already know is a crucial part of comprehensive marketing strategies. So, if you’re are a leading company or growing to become one, then it is pretty important to scale the local addresses as well. Lucky for you, Infinitum provides you with the capability to lease various location based IPv4 IP addresses for data audience analyzing. In a nutshell, the more you emphasis on the local targeting, the better you’ll have site traffic for the respective location. The evergreen strategy for SEO marketing. 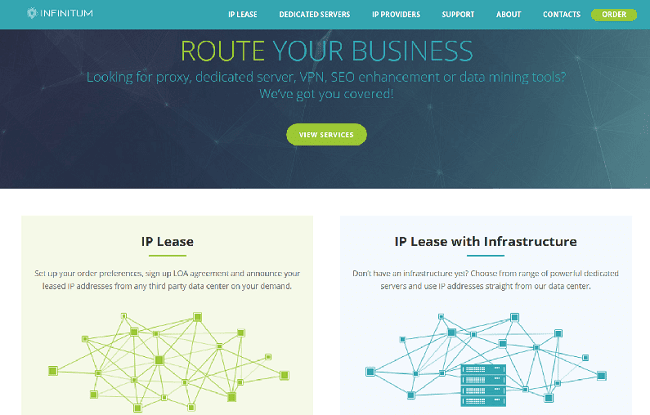 If you’re planning to start a hosting reseller website, then IP leasing might be a good asset for you. However, it would also grow you into a global scale company; then you need to serve to satisfy the whim of customers around the world. Infinitum Networks also helps you to lease a full block of different IP addresses integrated into an entirely designed infrastructure. One of the many applications of IP leasing. So how much does this remarkable service costs? Well, the standard IPv4 leasing is divided into suitable plans as per requirements. 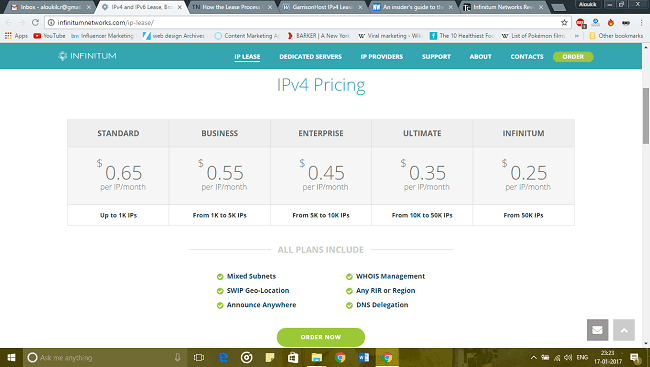 The standard plan starts from as little as $0.65 per month for one IP address. Moreover, as the plans increase for bigger applications, the price per IP reduces. The largest Infinitum plan offers IP renting for $ 0.25 per month with capabilities to host up to 50K IPs. There are other plans as about which you can get informed from the official Infinitum Networks website. All in All, Infinitum is the all in one solution for all your IP leasing requirements. You can simply fill up the form, and the company would verify your ID details. The company is widely known for its friendly customer support and know-how IT guys who help you with every query of yours. You can sign-up with Infinitum Networks, and the services are so good that you’d be able to access the IP addresses within 24 hrs. Do share your thoughts and comments on this remarkable IP leasing company below. Cheers!